The minister reportedly used a microphone stand when standing and sitting down. 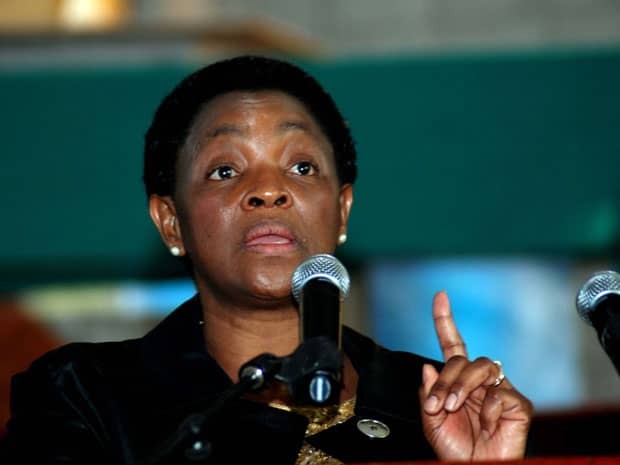 Minister of Social Development and ANC Women’s League president Bathabile Dlamini has been criticised for addressing a crowd allegedly drunk. According to those who were reportedly in attendance at the event at the Germiston Civic Centre in Ekurhuleni on Friday, the minister was allegedly “unsteady on her feet”. They further alleged Dlamini was struggling to to stand and used the microphone stand for support when sitting and standing up, Daily Sun has reported. Some people reportedly left without seeing her, as she arrived three hours late, according to the sources. Those who were patient enough to wait for her were not impressed with her speech either, as it was said to be unrelated to the topic at hand. She started telling people about how she grew up and the schools she attended, further talking about how women generally do not go to bars – remarks that left the crowd in stitches, but perhaps somewhat at her expense. When called for comment, the minister’s spokesperson, Lumka Oliphant, told the tabloid that Dlamini did not drink. In fact, ministers should “come” with something else, not alcohol, she was quoted as saying. The minister has been accused of being a drunkard, earning herself the name “Badakwile”. Last year during the party’s election campaign in Port Elizabeth, she left a few eyebrows raised after she cried because someone had “disrespected” her. The person in question reportedly told ANC leaders who were campaigning that they only cared about people during elections, remarks Dlamini could not handle. Some were left wondering if she was drunk.